“Any of you ever hear about the Massacre at Kovitch, or Aarnsdorf, or Feln? The man we’re about to meet, that was all his work. General Ranjit Lloyd-Kurnikov of the Black Watch Battalion does not take prisoners, and does not accept surrenders. So don’t do anything stupid, or interrupt me while I’m conducting my business. I won’t be surprised or object if he shoots one of you just for looking at him.” The arms dealer known as Mr. Perkins glared at the gang of shanty-men standing in a rough line next to his truck. He hated visiting shantytowns but sometimes it was necessary to get short-term help. If you could call this help. Turgenev had little enough to recommend it without this lot. Starports and the towns that grow up around them were the natural collecting point for vagrants, itinerant travellers and ex-space hands looking for work, or passage to the next system. When work was hard to find these men and women would dig in and build themselves ‘shanty towns’ on the outskirts of the port. These towns were wild, rough and dangerous, like the folks who populated them. Criminals found them useful as labor and cheap muscle. They were easy to hire, worked for cash, and nobody noticed their coming and going, or their not coming back. And if he doesn’t shoot you for interrupting, I will, he thought. Gods, I can’t wait to get off of this backwater nowhere of a world. After this sale, I’m going to take a nice long vacation. If Kurnikov uses this thing as much as I think he will, the Glaudens will want to know where he got it. Maybe I’ll take this guy with me when I leave, or maybe just pay him more, Perkins mused. Not that I wouldn’t shoot him too, to cover my tracks. But I’d feel bad about it. Maybe. Turgenev was off the normal trade routes so there were few Glauden Navy patrols to dodge, and lightly populated so much of the planet was uninhabited. The local technology was unsophisticated, which meant the starport would have a hard time detecting the cargo he had hidden inside a normal shipping container. Despite the advantages as a meeting place, Perkins was anxious to finish this and leave. He wanted to be far away from here to get beyond the reach of the Kingdom, if they should happen to find out how the General got his weapons. His supplier in the Lycosky Trade Protectorate had already vanished before his masters realized what he’d done. With luck this was the only time he would ever meet this client. Perkins had spent twenty years in the fierce world of the equipment trade, where a level of ruthlessness was expected. Even so, Kurnikov made him edgy. The rumor was that the man had a pathological need to completely crush every opponent. The weapon in the crate would enable him to do just that, on a scale he would not believe possible. The results would not be pretty. Perkins put that thought from his mind by reviewing his communications that had set up this meeting. Thirty million creds, his biggest score ever, were riding on getting this right. He scowled again. Time to eat something, and double-check his departure plans. He wanted his ship’s crew standing by to leave the moment he returned with his payment. Several hours later, Perkins was still scowling, but not at his temporary crew. They were busy arranging the contra-grav trailer they had disconnected from his truck. The gang boss had that under control, and they were working with something close to efficiency, other than making too much noise. Good thing the clearing he had selected as the meeting point was miles and miles from any local habitations. Now he scowled at the uniformed man standing before him. He was surprised how unimpressed he was. The general wore a fancy uniform, with lots of medals which rumor said he had awarded to himself. His dozen men also had complicated and impractical uniforms with matching head-dress. Helmets was too serious a word for the colorful array of wings, badges and ornaments. Their two vehicles were marked with Black Watch logos and no attempt at camouflaging. Lloyd-Kurnikov himself was not physically imposing, and the way he stared down that long pointy nose rankled Perkins’ pride. It did not escape his notice that all of the General’s men had gauss rifles slung by their sides. Still, this was business, not a social call. 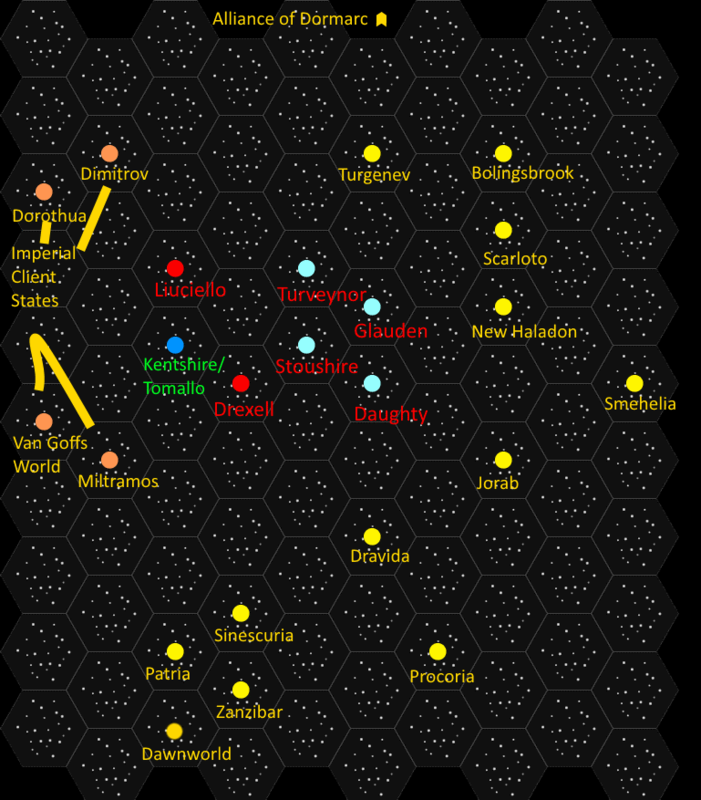 The Liuciello-Drexell Alliance was losing its war against the Kingdom of Glauden for the newly opened planet Tomallo. The two sides were nearly even in technology and size of forces, but the Kingdom was all under one banner. The LDA couldn’t get its act together and coordinate their forces. Lloyd-Kurnikov did have a reputation for brutality, but more importantly he now had a reputation for winning. The LDA were bringing in this mercenary’s Black Watch to tip the balance in their favor. However much the General annoyed him, Perkins was here to make a deal. He hoped that his most businesslike tone would mask his dislike of his client. He gestured towards the large storage box resting on a contra-gravity pallet, next to a large utility truck. The work gang flowed around it, disconnecting the pallet and setting it on its stand. Perkins’ gang wore much more practical jumpsuits and caps. Also, only the gang boss and the men he had selected as team leaders were armed. “Let me get right to the point, General. Your current employers are losing the war and expect you to turn it around for them. You’re here because you want something that will give you a decisive edge before you go in against the Kingdom forces on Tomallo. I assure you that this will give you that edge.” He gestured towards his gang boss, who barked more orders. The work gang opened the storage box to reveal a squat, semicircular machine covered in a shiny gold-colored metal cowling. Its surface was smooth except for a single operating panel on one side and a two-meter globe resting in the top center. Your eyes say differently, Perkins thought. But you’re trying to hide it. Probably he was going to try undercutting the price they had agreed upon. Fine, you get the full sales pitch, then. It cost me a lot of time, money and not a little danger of discovery to acquire this bit of hardware. “And the Glaudens have nothing like this?” Lloyd-Kurnikov asked hurriedly, then frowned as he realized he betrayed his level of interest. “Of course, they do, but only aboard their larger fleet elements as spinal mounts. And they have no suspicion that anyone who will be on the ground on Tomallo will have access to this technology. I acquired it from a vendor with connections to the Trade Protectorate. Nobody but the Big Four star nations have this kind of equipment on the battlefield. If we’re agreed, I just need to see the money, and I’ve got the master control codes right here.” He held up a computer memory card. Perkins’ team leader and two other men stepped forward, waiting to inspect the payment. “That will be all, Lieutenant. We move when I say we move.” Obediently the officer stepped back. None of his soldiers had even looked when the alarm sounded. A minute crept by, then bursts of automatic fire shattered the stillness. Then voices were shouting orders, and a flare blazed skyward. Mr Perkins snatched at his comm unit. “What’s happening?” he barked. “Ambush, boss! It’s the Feds, maybe a dozen of them! We’re …” the voice broke off as more fire rattled through the clearing. Then more shouting, and a grenade banged, shaking the foliage near the clearing edge. “Give me the codes, we’re leaving!” the General demanded, snatching the card from Perkins’ hand. Lloyd-Kurnikov rapped out orders to his soldiers, who rushed to pack up the weapon. More shots rang out at intervals. His lieutenant unslung his weapon, but the General stopped him. “We have what we want. Set up a trailing defense with your vehicle half a kilometer behind mine. The weapon goes with me. Wait sixty seconds after we depart, then catch up.” The Lieutenant saluted. “Mount up,” Mr. Perkins announced to his remaining men. “What about those guys, boss?” a henchman asked warily. “If they survive, I’ll give them a bonus. If they don’t, I guess I don’t have to pay them at all.” The workmen hastily loaded the crates of bonds into the contra-gravity truck and piled into the rear. The truck sped away into the darkness. As the two parties hurried off, the gunfire suddenly died away. Silence covered the glade for several minutes, then Captain Alex Kingsway, former Glauden Space Patrol navigator and recently Mr. Perkins’ gang boss, emerged from the brush. He tossed aside the cap Perkins had issued him several days ago. “All clear, guys, come have a look.” Scott Heath, Glauden Army medic, and Jake Radley, Space Patrol Engineer, joined Alex in the clearing, dropping Mr. Perkins’ gear into a pile. Scott hesitated to drop the auto-rifle which he had planted in the trees earlier that day. “Nah, we should destroy it all.” The gun, and a thermite grenade, topped the pile of gear. Alex took out his comms unit and pressed a button, nodding in satisfaction as a green light came on. The comm began sending out a low-wavelength signal. “It’s working,” he reported. Kilometers away, Mr. Perkins and his men scrambled to get clear of the flames that burst from the rear of their truck. Seemingly out of nowhere, fire had engulfed all three crates, and rapidly spread to the vehicle’s interior. “Who in the nine hells loaded those crates onto the truck?” Mr. Perkins seethed. “Where’s my gang boss?” Then he stopped short, remembering he had left the man in the treeline dealing with the Federals. Probably got himself killed. After this I would have shot him anyway. Perkins boiled. Seven months of work, several favors and thirty million in non-traceable commodities going up in smoke! The men of his gang stood staring in confusion, afraid to speak while Perkins raved at them, the General, and the world at large. The shanty-man never heard the shot that killed him. The next day Mr. Perkins met with his contact at the starport. Finding the ship had been easy, but the Black Watch troops had been unwilling to give up any information, even at gunpoint. The argument had cost several of them and some of Perkins’ gang their lives, and still gave no answers. “How in the nine hells did the Kingdom find out about the Predator sale?” Mr. Perkins yelled.